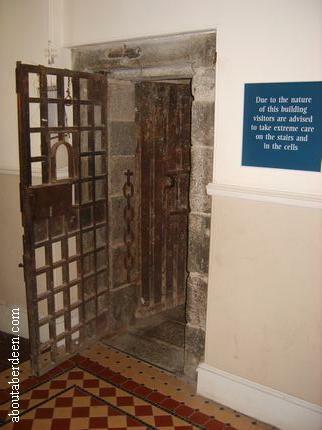 The Tolbooth Prison Aberdeen is a well preserved example of a 17th Century Scottish goal. Admission is free and guides are within the building to answer your questions and to give brief talks. The Museum also runs special days and programmes, including re-enactment days and talks. 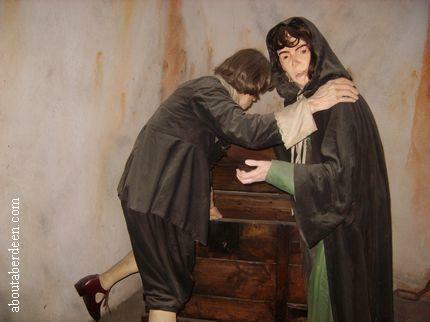 There are narrow steps to negotiate, so unfortunately the Tolbooth Museum is not suitable for disabled visitors. 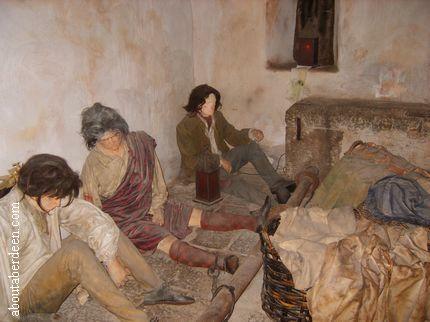 It can get quite dark inside, especially in the cells, so you may wish to pre warn the children - ours got scared by a taped recording of a prisoner crying, though were fascinated by the waxwork dummies which were held prisoner in the cells. The original 17th Century column of Aberdeen's Mercat Cross is on display at the entrance. Other rooms hold historical pieces such as a Jacobite flintlock pistol, witness statements given against the Jacobites of Aberdeen and a first page of a list of Jacobite prisoners. Over 50 Jacobites were held prisoner in the Tolbooth after the battle of Culloden. There are also displays of Jacobite coins, propaganda medals and touch pieces. 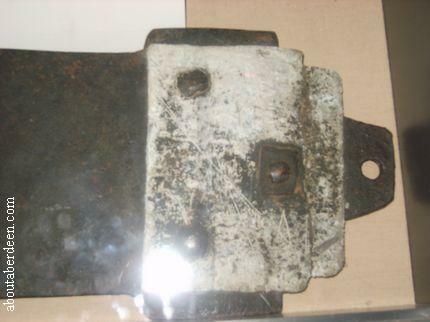 In another cell there is an original 16th Century Guillotine blade, leg fetters and a scold's bridle. In the Gaoler's Room next to the cell is a peep hole on the wall that overlooks Union Street. 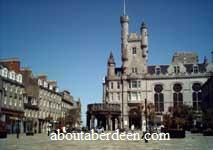 Guided tours of The Tolbooth Museum in Aberdeen, Scotland, are run in conjunction with the Past Times Theatre Company and the Aberdeen City Council Archaeological Unit. The tours are by appointment only and are only suitable for those aged 12 and above. The actors from the Theatre Company enact roles such as a gaoler. Watch out for a few surprises and be prepared for the chilly atmosphere! The Tolbooth opens in the summer months with free admission and themed events. For further details see our events page. The Tolbooth can arrange school and party visits. The original building on the site of the Museum was built in 1393 as an area for collecting tolls for goods that were bought and sold. Years later its role changed to that of a holding place for prisoners about to be tried at the court. This then developed into a general prison. The Wardhouse, now known as the The Tolbooth Museum, was built between 1616 and 1629. Several cells still exist in their original format and can be explored at your peril! The current gaolers reminisce about the past occupants and the conditions they were kept in. You may wish to brush up on your Doric Words beforehand! 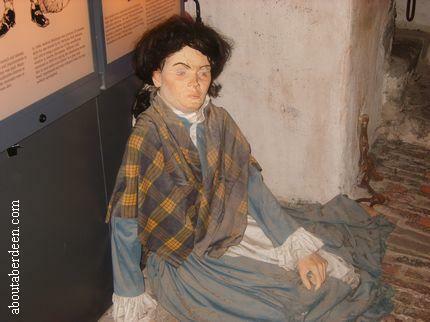 The most famous inmate was Janet Walker, known as The Fittie Witch. She was a 17th Century woman called Janet Walker who was suspected of witchcraft. Paranormal investigators go ghost hunting at Aberdeen Tolbooth throughout the year. You can take part in this organised ghost hunt and ghost walk through the historic Aberdeen Tolbooth where you can learn how to use ghost hunt equipment and help them find evidence of ghosts. Those who take part in the ghost hunt are given a training workshop during the night which includes learning how to use the ghost hunting kit described at The Ghost Hunting Experience Page. A buffet and refreshments are provided and there is a ghost walk through the building with a medium. Book a Ghost Hunt Experience or More Information. The Tolbooth ghosts have manifested themselves to many people over the years and more recently Aberdonian author Graeme Milne spent some time at the Tollbooth in Aberdeen to investigate the ghosts. He has written about his findings in his book The Haunted North: Paranormal Tales from Aberdeen and the North East which includes other peoples accounts of seeing a more modern ghost. This has been described as a man of four feet tall wearing 1920s clothing with a trilby hat. This visitation has caused several people to flee the Tolbooth in Aberdeen. It is thought that he appears as 4ft because the floor has been raised since he was alive. During his time in the Aberdeen Tolbooth Graeme Milne witnessed a white mist and photographed a strange orange light. Strange noises were heard and this included the sound of shuffling feet and the sound of a chain moving. He also felt icy cold down the left hand side of his body and heard a deep male voice mumble into his ear. Others in his group had the feeling of finding it difficult to breath and a tightening around their necks. Read more about his findings in The Haunted North: Paranormal Tales from Aberdeen and the North East . The Aberdeen University based East of Scotland Paranormal (ESP) team held an investigation at the Aberdeen Tolbooth in December 2007 with the help of Chris Croly the Tolbooth Museum Curator. This included three guest mediums. Using standard ghost investigation equipment such as a camcorder, trigger objects, EMF Meter, Laser Thermometer and beam barrier alarms the team set out to discover any ghosts or spirits occupying The Tolbooth Aberdeen. A s�ance was also held at The Tolbooth. The ghost hunting team found Criminal Cell 2 made some of the team uneasy and there were strange smells. Orbs were seen during a vigil and captured by the teams camera. The presence of a man and young boy was felt by the ESP team whilst one member of the team felt pressure on her chest and throat. During the s�ance one member of the East of Scotland Paranormal team felt like she had been beaten up, particularly around her back and kidneys. Another medium felt the labour pains of a young woman who died in child birth at The Tolbooth in Aberdeen Union Street. Directions - The entrance can be found at the bottom of Union Street (the main shopping street), by Castlegate on Castle Street, right next to the Town House. The Museum is open from 1000 hours - 1600 hours Tuesdays - Saturdays and from 1230 hours - 1530 hours on Sundays. It usually opens from July through to September. There are 86 steps on the Tolbooth stairs. There is no disability access but disabled visitors can watch the video presentation at the entrance. A Paranormal Event at the Tolbooth takes place on the 26 July 2008 from 8pm until 6am. This over night paranormal event at the Aberdeen Tolbooth includes overnight access, a buffet supper with tea and coffee, a psychic workshop, a demonstration and use of ghost hunting equipment followed by a ghost walk with a medium and experienced investigators during the late night vigils. During the night of paranormal events at the Tolbooth Aberdeen the team will conduct paranormal experiments. Before you go home there will be a post investigation discussion which includes a talk with the historian. This Tolbooth paranormal event costs �99 per person and can be booked at paranormaltours.com or paranormaltours.tv. AboutAberdeen visitors can take advantage of a 10% discount at Paranormal Tours Limited when they quote the discount code MAY2008. Sunday 7 and 14 December 2008 - The Tolbooth Winter's Trails 4pm and 6pm each day. Tickets �7 (�6 concessions and friends of Aberdeen Art Gallery & Museums). Refreshments are included. Booking is essential on 01224 523700. For those brave souls who have no fear of ghosties there are Halloween tours of the Tolbooth Aberdeen.  In 2008 these take place at 6:30pm and 8pm with a cost of �5. Graeme Milne, the author of The Haunted North: Paranormal Tales from Aberdeen and the North East will be there along with members of the East of Scotland Paranormal Group. 12 August to 14 September 08 - Images of the Castlegate at The Tolbooth Museum. A rare opportunity to view historical impressions, painting and photographs of the Castlegate, brought together from the City�s diverse collections. Thursday 28 August 2008 - free lunchtime talk - Aberdeen City and Shire A History of Relations 1600-1900. Ruaraidh Wishart, Aberdeen City Archives. At The Tolbooth Museum from 12:30 to 1pm. Thursday 21 August free lunchtime talk - Saints Dedications in Aberdeen by Sally Crumplin, Research Assistant. At The Tolbooth Museum from 12:30 to 1pm. Saturday 16 August 2008 � Re-enactment: Tales from the Tolbooth � Mary Queen of Scots. A lively re-enactment of the final meeting between Mary Queen of Scots and Sir John Gordon of Findlater, before his execution in the Castlegate. Sir John and his father, the Earl of Huntly, had rebelled against Mary in 1562. Following the defeat of Huntly at the battle of Corrichie, Sir John now awaits his fate. At the Aberdeen Tolbooth Museum at 11am, midday, 2pm and 3pm. Thursday 14 August free lunchtime talk - The Castlegate in Bye-gone Days by Catherine Taylor, Aberdeen Central Library at The Tolbooth Museum from 12:30 to 1pm. 8 July - 10 August 2008 - Offences and Penalties - Stories From Grampian Police Museum. A fascinating insight into policing in the 19th and 20th centuries. At The Tolbooth Museum, Aberdeen. Thursday 24 July free lunchtime talk - Aberdeen and Robert the Bruce by Chris Croly, Assistant Keeper (Research) at The Tolbooth Museum from 12:30 to 1pm. 26 July 2008 - Paranormal event at the Aberdeen Tolbooth. 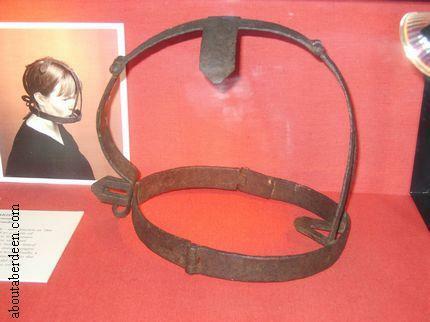 The following talks take place at the Tolbooth prison museum in Aberdeen from 12.30pm to 1pm. Places are limited to 20 people per talk so it is important to book your place on (01224 621167) during opening hours to reserve a place. All talks at the Tolbooth are free. Monday 5 May 10am - 4pm - Show Scotland Civil War at The Tolbooth. An exciting re-enactment in The Tolbooth Museum set in 1644 during the Civil War. Aberdeen is on the side of Parliament and the Marquis of Montrose and his Royalist army are approaching Aberdeen. Join in the debate by the Town Council as to whether or not they should let Montrose enter Aberdeen and stand and fight. For further information please call 01224 523653. Event will be held at 11am, 12, 2pm and 3pm. On Saturday 16 June and 15 September 2007 the lunchtime talk at the Tolbooth is Kidnapped. This is a lively and dynamic re-enactment set in and around The Tolbooth. Learn all about the hidden history of Aberdeen in the 18th century when the magistrates in Aberdeen kidnapped children from the city and sold them off as indentured servants in America. Meet the kidnappers and the children and get a chance to participate in the trial of one of the children, Peter Williamson, who returned to Aberdeen and wrote a book about his experiences. Admission is free but die to limited spaces booking is essential on telephone number (01224) 523644. Supported by the Heritage Lottery Fund. On the 5 July 2007 Keiran German, a PhD student at the University of Aberdeen, will give an account of his latest research on Aberdeen and the 1715 Jacobite rebellion. This talk will complement the exhibition Aberdeen and the Jacobite Rebellions: 1715 and 1745. On the 19 July 2007 Chris Croly, the Assistant Keeper (Research), at Aberdeen City Council Archaeological Unit, will examine the history of Aberdeen�s castle. The Aberdeen castle briefly slips in and out of recorded history but has an exciting history bound up with the wars of Independence. On the 2 August 2007 staff from Paranormal Tours will talk about their recent work and paranormal activity in the Tolbooth at Aberdeen. 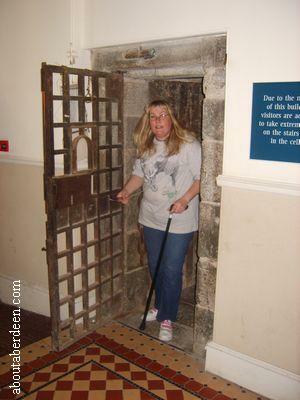 Paranormal Tours conducted a series of experiments in the Tolbooth in late July 2007. Reported paranormal activity and hauntings at the Tolbooth in Aberdeen have included the people feeling watched, hotspots and coldspots, sudden strange smells and the feeling of despair, whisperings being heard, tapping noises and light anomalies. On the 16 August 2007 Stewart Thain, Assistant Keeper (Research) at Aberdeen City Council Archaeological Unit, will talk about the last years of Scotland�s coinage. As an effect of union in 1707 Scotland and England�s coins were standardised in value and design. This talk will explore these momentous events. On the 30 August Sasha Turner, Research Assistant Aberdeen City Council Archaeological Unit, will talk about the results of her research. 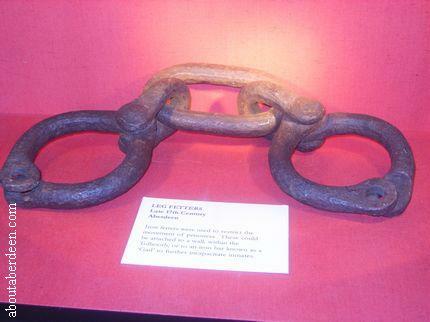 This research has been examining aspects of Aberdeen�s connections with the Trans-Atlantic Slave Trade and Abolitionism this year as part of the bicentennial events commemorating the abolition of the slave trade in the British Empire. On the 6 September 2007 Fiona Musk of Aberdeen City Archives will give a talk on the Dean of Guild records for the year 1707. The records contain a fascinating and varied account of events in this momentous year. These include remarkable local and significant national events. From the 3 July to 5 August the Tolbooth Exhibition will be Aberdeen and the Jacobites: 1715 and 1745. This is a rare chance to see Jacobite items in the City�s collections, including healing touch pieces issued by the Old and the Young Pretenders, as well as documents from the City Archives. A fascinating insight into the hopes and fears of both the rebels and those on the side of the Hanoverian government. From the 6 August to 9 September there will be an exhibition at the Tolbooth Aberdeen entitled 1707: Cause and Effects of Union which is a significant opportunity to see items relating to the Act of Union in 1707 which helped to create Great Britain. Amongst the items on display will be coins from both before and after the union, showing the changes caused by the Act, and Imperial weights and measures which pointed the way to the development of a unified British state as envisaged by the Act. As part of the Tartan Day festivities on the 4 August 2007 the Tolbooth Aberdeen will host a Tales From The Tolbooth: Jacobites event. Visitors can find out all about the hopes and fears of the rebels after the Battle of Culloden in 1746. Hundreds of prisoners were brought back to Aberdeen. Meet the prisoners and meet a Hanoverian officer preparing to interrogate the defeated rebels. As part of the Doors Open Day on Saturday 9 September 2007 the Tolbooth Aberdeen will be re-enacting the Fittie Witch Story. Discover the fate of 17th century Janet Walker, a suspected witch who will be interrogated by the Tolbooth Gaoler. Find out all about the fears of the inhabitants of 17th century Aberdeen and learn about the treatment and fate of those suspected of witchcraft. Many Tolbooths had nicknames. 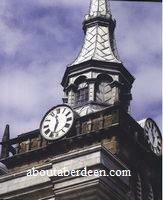 For example the nickname of the Edinburgh Tolbooth was the Heart of Midlothian.